A dramatic reading of some lesser-known works by Edward Lear (1812-1888), English author, illustrator and poet who is known mostly for his nonsense poetry and prose. Among the works read are the "Nonsense Cookery" and "Eclogue". The readers are Myrna Charles, Kathleen Dalton, Mike Hodel, Larry Holpp and John Wilson. Selection and direction by Baird Searles; technical production by Sam Sanders. 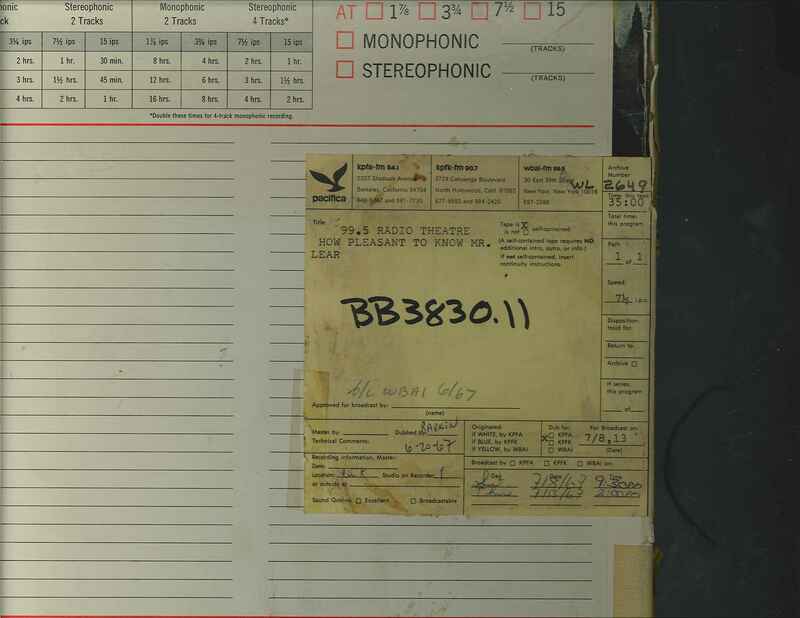 This recording was formerly cataloged as BB3830.11. WBAI, 8 July, 1967. First broadcast on WBAI, 10 June, 1967. 1 reel (35 min.) : 7 1/2 ips, mono.